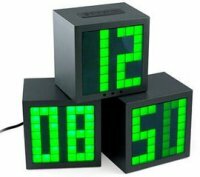 Take a glance at the Matrix Cube Alarm Clock and chances are you’ll either hate it or love it, depending on your taste for all things retro. The hours, minutes and seconds are separated by their respective cubes, so make sure they’re all in order lest you wake up at 59:12 in the…wait a minute. 59:12 is no time! Must’ve had a wee bit too much to drink the night before, eh? Connected by thin ribbon cables, each clock module can be stacked vertically, horizontally or in a pyramid, depending on your mood and the alignment of Jupiter and Saturn’s moons…Each cube is approximately 3.5″ square. 12 or 24 hour format available! Even includes a snooze button. You can now bring home the Matrix Cube Alarm Clock for $34.99 from ThinkGeek. Oh, this looks awesome!! I want one! !